A residential fire can be financially, emotionally, and physically devastating to all involved. According to the National Fire Prevention Association, U.S. fire departments responded to approximately 367,500 home structure fires in 2014. Unfortunately, these fires caused an estimated $6.8 billion in direct damage. If you want to protect your home from a fire, then many residential siding experts recommend using HardiePlank siding. HardiePlank siding is a fire resistant siding that is used on the outside of residential homes. 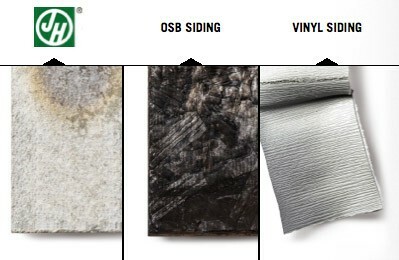 It is manufactured by James Hardie and is made from fiber cement. The fiber cement is a concrete-based fire resistant component that greatly reduces the likelihood that the siding of the home will ignite during a fire. It is a resilient mixture of wood pulp, Portland cement, water, and fly ash or silica sand. The water is used to dissolve the wood pulp, as well as to activate and harden the cement. Wood pulp improves flexibility and resilience, while the fly ash or silica sand acts as a filler. Finally, the Portland cement is used to bind the ingredients together. The beauty of HardiePlank siding is that it can be treated to look like painted clapboards, stone, brick, or shingles, while simultaneously offering better fire protection for your home. From the fire departments to insurance companies, siding experts recommend using HardiePlank siding in arid areas that are prone to wildfires. Some insurance companies will even offer a discount to homes that use a fiber cement siding, like James Hardie’s HardiePlank siding. This discount is primarily due to the material’s ability to hinder fire invasion into a home’s exterior. In the event of a local exterior fire, HardiePlank siding can help to protect the exterior of the home by keeping the fire away from your home’s flammable wooden studs. Whether you want to have peace of mind, need a low-maintenance siding solution, or are worried about the risk of a house fire, the experts at Lakeside Exteriors can help you to determine if HardiePlank siding is the optimal choice for your home. Lakeside Exteriors is proud to provide the best siding solutions for residential homeowners throughout the greater St. Louis area. Contact us to receive a quote or schedule a home siding consultation today.